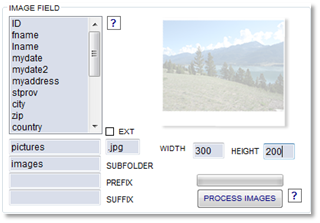 Define which field holds image data and provide options to resize images as needed. We have provided a means to process a folder of images you pick using the size you define in Data Asap. The original images will be preserved in a backup folder at the same level. You can also define thumbnail images as well in the same manner processing your original images and saving a backup.